Yahoo Messenger is a well known instant messenger to chat with friends and family. The Yahoo Mobile Web Messenger now offers SMS capabilities to send instant messages and emoticons to your friends from mobile web messenger to your friends mobile phone numbers for free. You can now send Free SMS to your IM friends or any mobile numbers. The newly updated Yahoo Mobile Messenger interface has an enhanced search box which lets you to search for contacts just by their name or phone numbers. 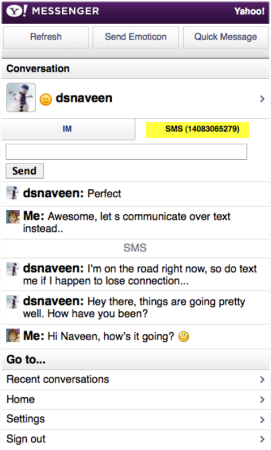 You can easily toggle between IM and SMS conversations. The Yahoo Mobile Blog states that, there is no separate app to install on your phone … whether you have a smart phone or standard featured phone, all you need is to have your data plan. If that is ready, then you can directly enter m.yahoo.com/messenger into the mobile browser on your phone, and you are all set to go! Is it available in your country yet!? Susannah Lindsay quit her job a few years back to settle down in a life of domesticity. She has been living in Los Angeles for the last three years, and enjoys following new gadget releases and the latest happenings on the technological front.